Most Standard Big-Block Chevy Components! The BB-1 rectangular port head has an as-cast 280cc intake port and is available with a 110cc, 115cc or 119cc combustion chamber, but may be angle milled to 108cc or angle machined to 98cc. The BB-1 is designed for a 396-502ci engine with a flat tappet or hydraulic cam. Most marine applications use this head for torque and throttle response. The BB-1 features a CNC'd intake port match and bowls are blended while the intake ports, exhaust ports and combustion chambers remain as casted. The STS series BB-1 head comes completely CNC-ported with a 305cc intake port and flows over 370 cfm maximum port velocity. The BB-2 and BB-2 PLUS head works well with a heavy car and smaller displacement engine (427-509ci). The BB-2 has an as-cast 305cc intake port and flows 320 cfm; the BB-2 PLUS has an as-cast 312cc intake port and flows over 340 cfm with only the bowls blended and the intake ports matched. The 119cc combustion chambers are properly shaped for use with either methanol or gasoline, preventing detonation. While creating the 100% CNC Ported STS series BB-2 PLUS, the professionals at Brodix invested many long hours on the flow bench and at the track developing a completely ported cylinder head. Brodix incorporated this porting design into a ported masterpiece that can be mass produced. The STS BB-2 PLUS heads are CNC-ported to a mirror finish and flow within 1% of each other. The bottom line is that Brodix builds you the most accurate, best flowing out-of-the-box cylinder heads available at the best price. 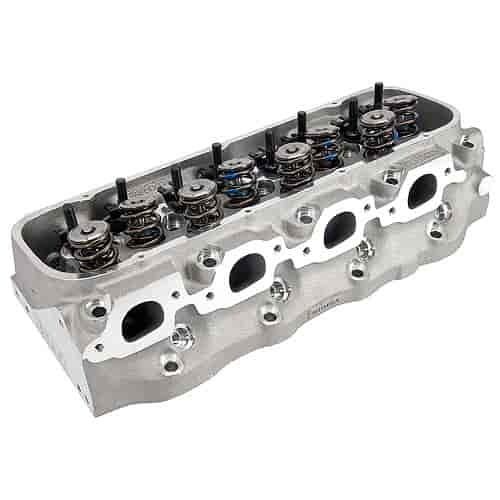 All of these cylinder heads accept standard pistons, intake manifolds, and rocker arms. The exhaust ports are raised .600'' higher than stock, and the valve cover rails are raised to assure no oil leakage. Every casting is poured from A-356 virgin aluminum and tested before Brodix utilizes their in-house processes such as finish machining and heat treating to assure that you receive the best products for your hard-earned money. The industry standard has been taken to the next level with modernized CNC porting. Other features include a thick deck surface that is compatible with nitrous, drilled and tapped holes on the ends for standard drive accessories, phosphorous bronze valve guides and hardened valve seats installed for unleaded fuel. Sold Individually, 1/pkg. ! Spring Pressure Open: 360 lbs. Spring Pressure Open: 745 lbs. Spring Pressure Closed: 255 lbs. Spring Pressure Open: 945 lbs. Spring Pressure Closed: 330 lbs.